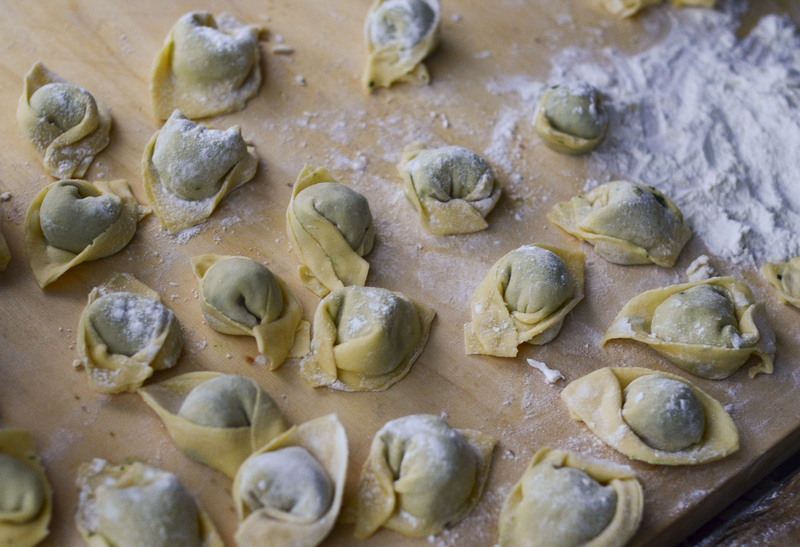 Pansoti are the typical Italian Riviera ravioli-style pasta to eat at home on Sunday lunch. This is my family recipe. This dish is a clear example of Ligurian cuisine: linked to the territory, genuine, straightforward but always extremely tasty. 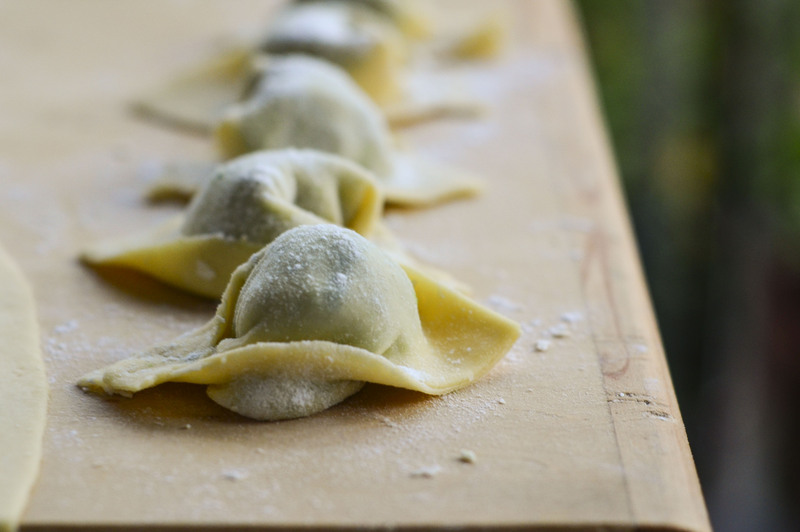 Pansoti are traditionally stuffed with a mix of wild herbs gathered in the fields called “prebuggiùn“(/’prebuddʒun’) (discover more clicking here!) and with a fresh local cheese called prescinsêua (/’preʃʃinsea/) which is across ricotta and sour cream. 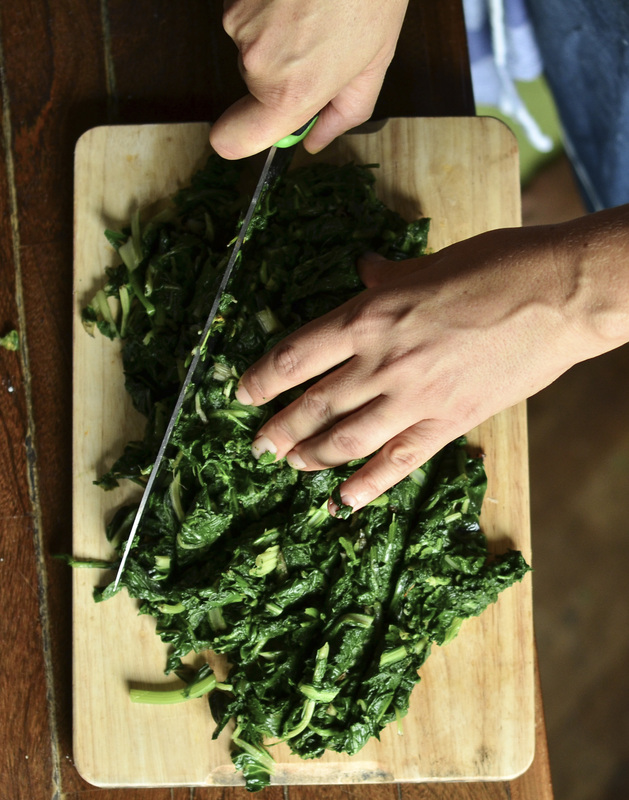 As these ingredients are difficult to find even inside the Italian Riviera borders, people commonly adapt the traditional recipe using greens generally sold in the markets. 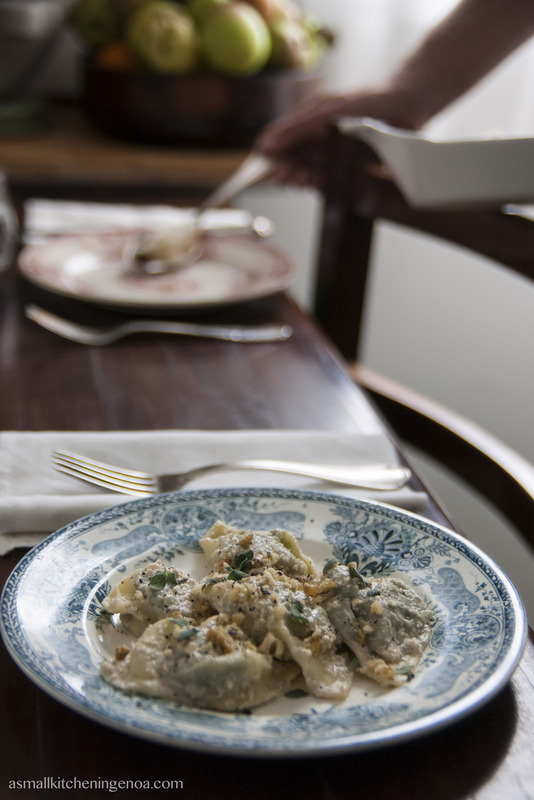 For example we us a mix of spinaches, chard, borages and endive, and ricotta. The result is fine anyway! 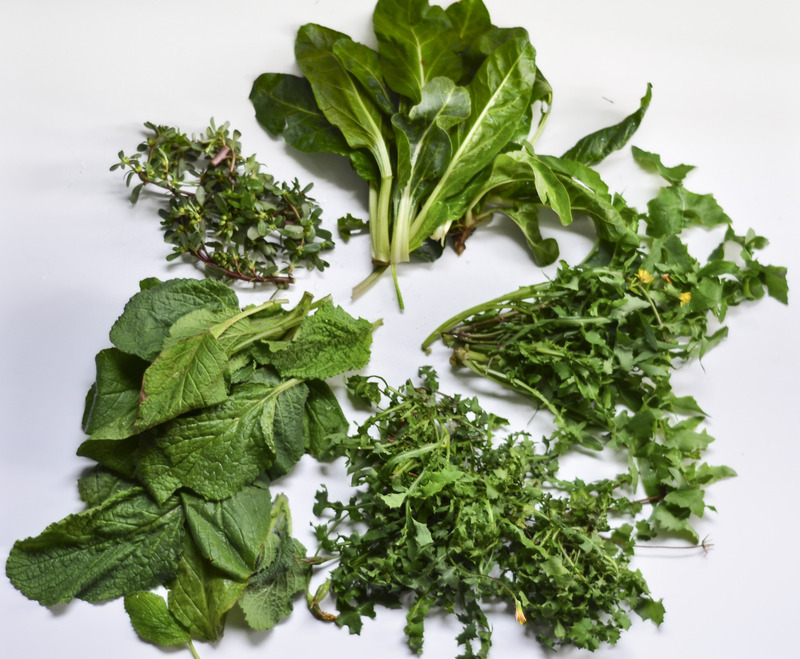 For the pansoti showing in this post my prebuggiùn (I know a couple of farmers who can provide me wild herbs on request) was made of borages, wild chard, dandelion, purslane and wild rocket (I’m not 100% sure, though….). 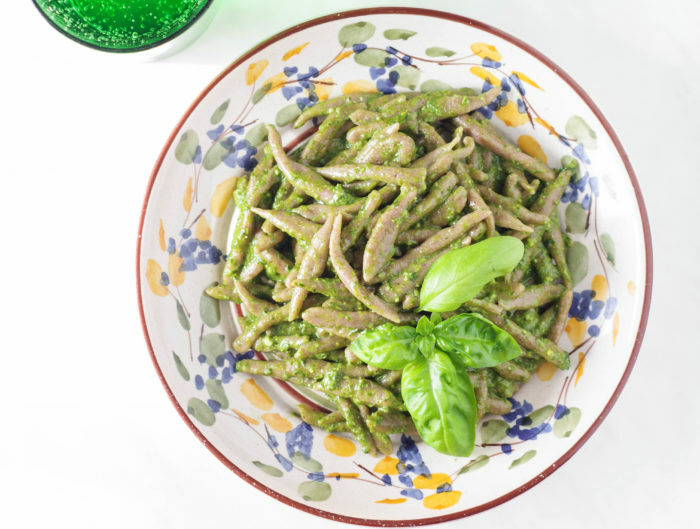 The famous walnut sauce (second in Liguria only to basil pesto, for its recipe click here!) 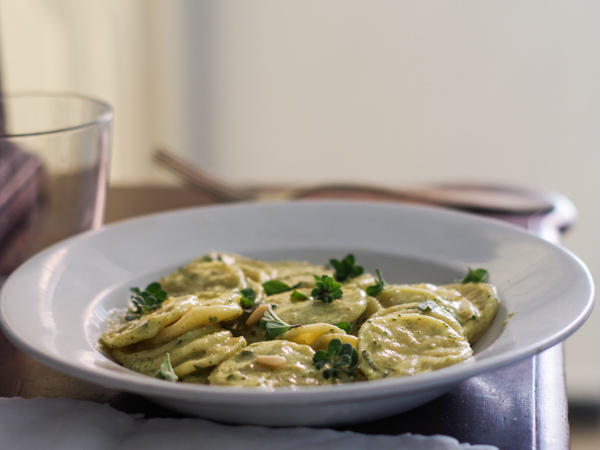 is the traditional seasoning which exalts the grassy flavour of these ravioli. On my opinion, however, the delicate taste of the greens inside them emerge as well just with a simple seasoning of butter and parmesan cheese. 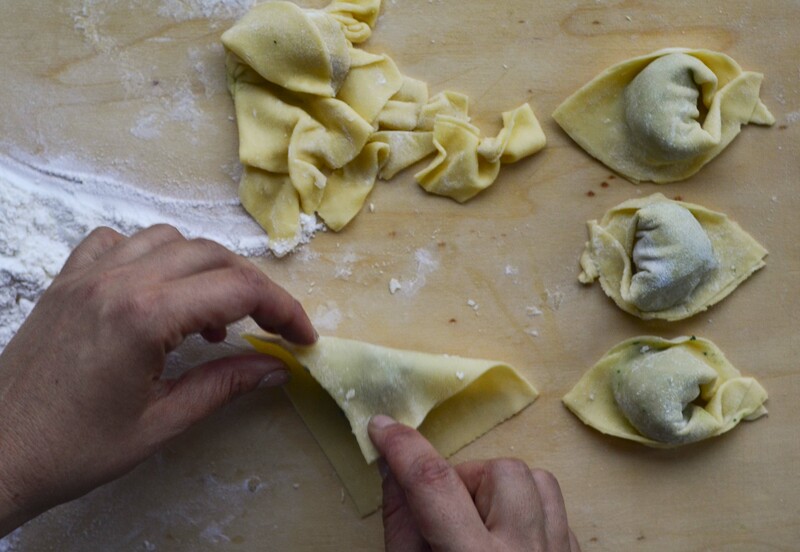 Before the recipe a funny fact: the word “pansoti” derives from the Ligurian dialect “pansa” which means belly. Therefore, when you prepare pansoti remember always that they must turn out well paunchy! 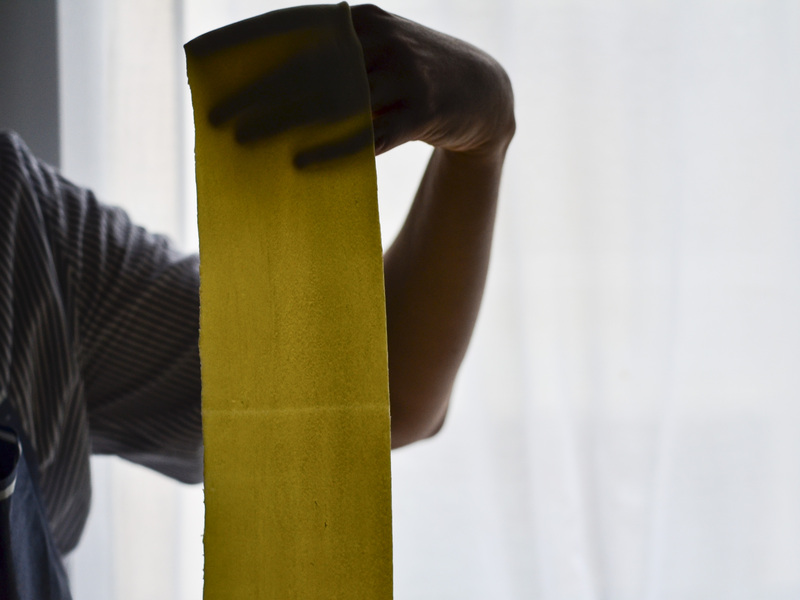 Finally, to help you with the recipe my friend Lorenzo took some beautiful photos of me preparing them. Actually – and I’m not joking – he took 1265 photos. Select the ones you find here below was a though work, but I’m so happy with them! So look at the photos below, get inspired and run to the market to buy all the ingredients!! 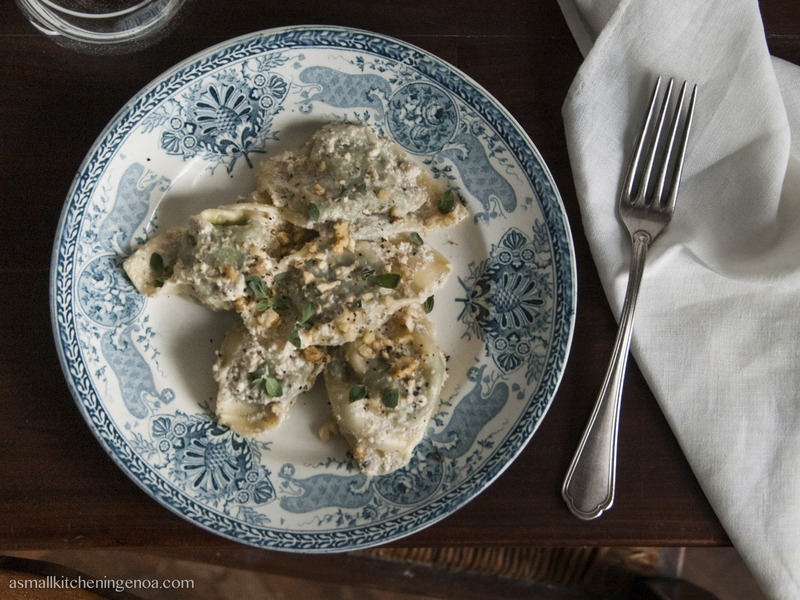 Pansoti, the Italian Riviera traditional ravioli. 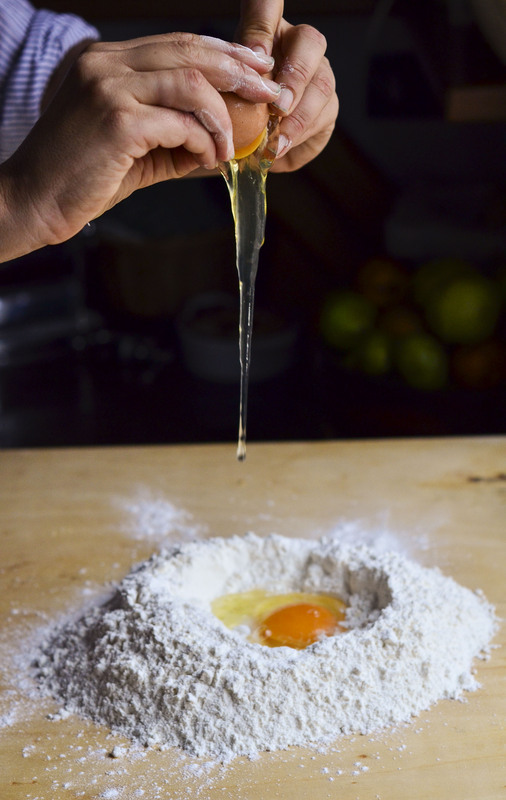 Put the flour on the working surface and make a well in the middle like a volcano. Open the eggs in the centre of the crater and beat them slightly with a fork, add 4 tablespoons of white wine, 4 tablespoons of water, a pinch of salt and start mixing the liquids with the fork. Then star adding flour to the mix gently digging the side of the crater with the fork. 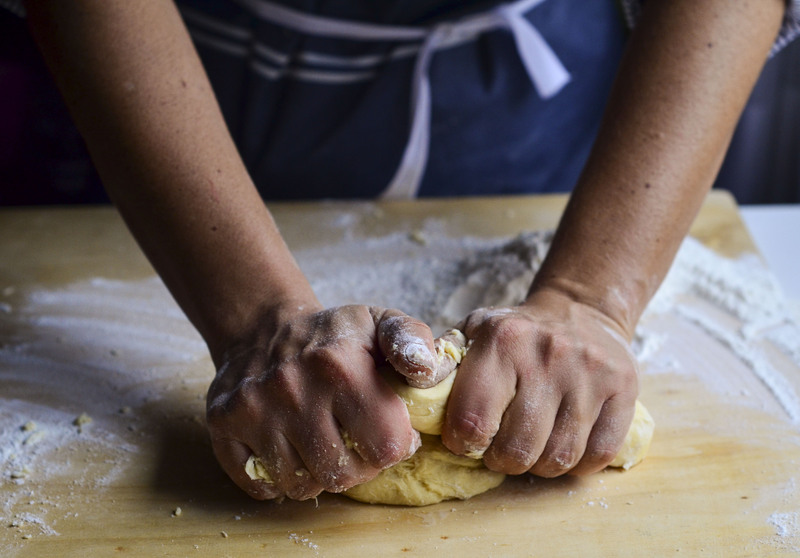 Little by little the dough will harden. 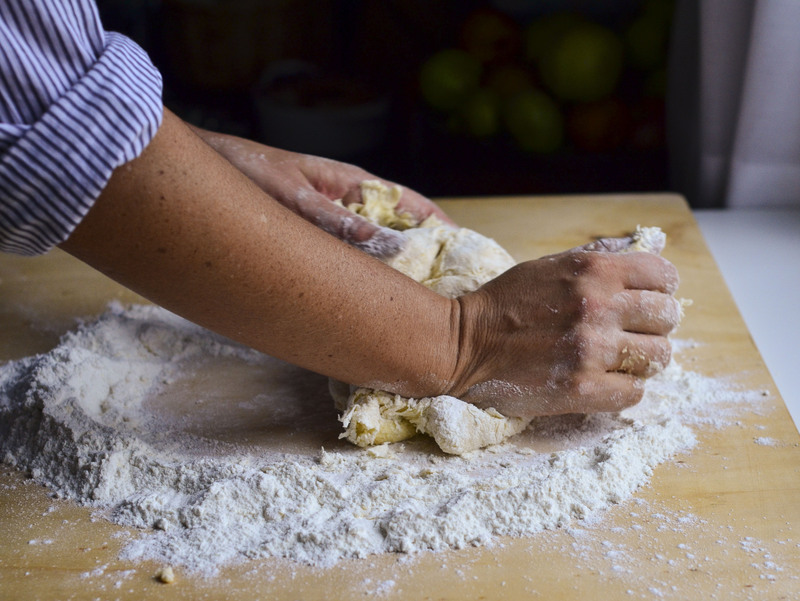 When the dough starts “staying together” dig your hands and start knead it, blending and pressing it with the lower part of your palm for many times. If it remains too dry and in flakes add a small quantity of water just wetting your palms. 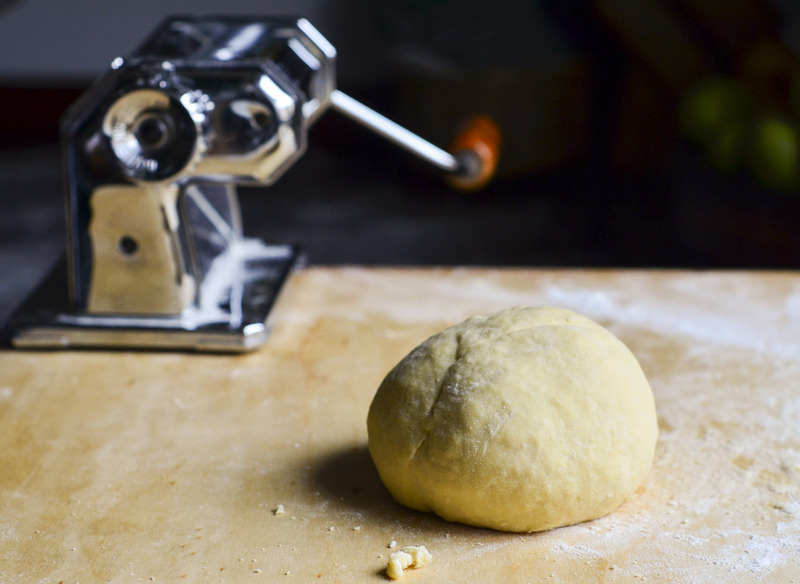 Repeat if needed until you get a dough smooth and elastic (ab 10 minutes kneading). 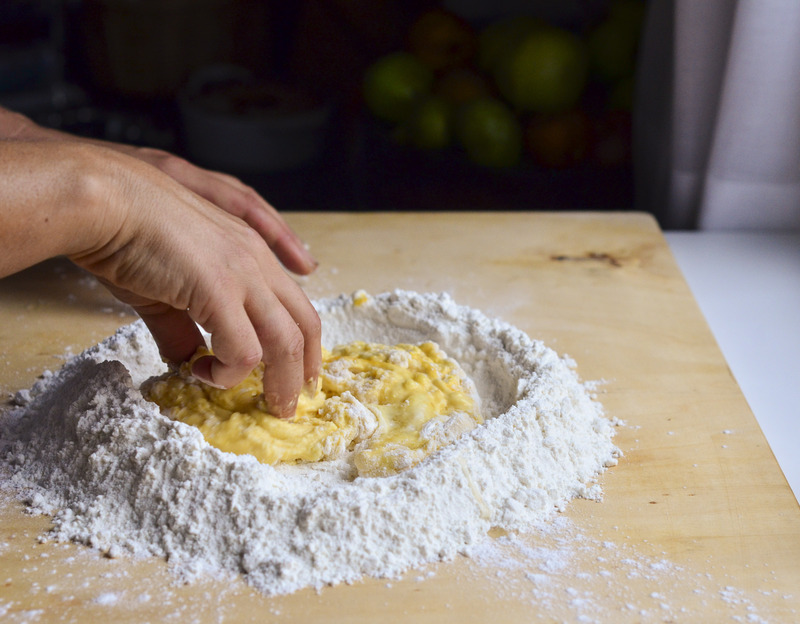 You can check if its elastic enough putting a finger in the dough: if the dough returns in its previous shape and the hole almost disappear it’s ready. Let it rest under a humid tea cloth for half an hour. Clean the greens and boil them in a slightly salty water for 5 minutes then drain, squeeze very hardly (if they are too hot pass them under cold water) and chop them finely. 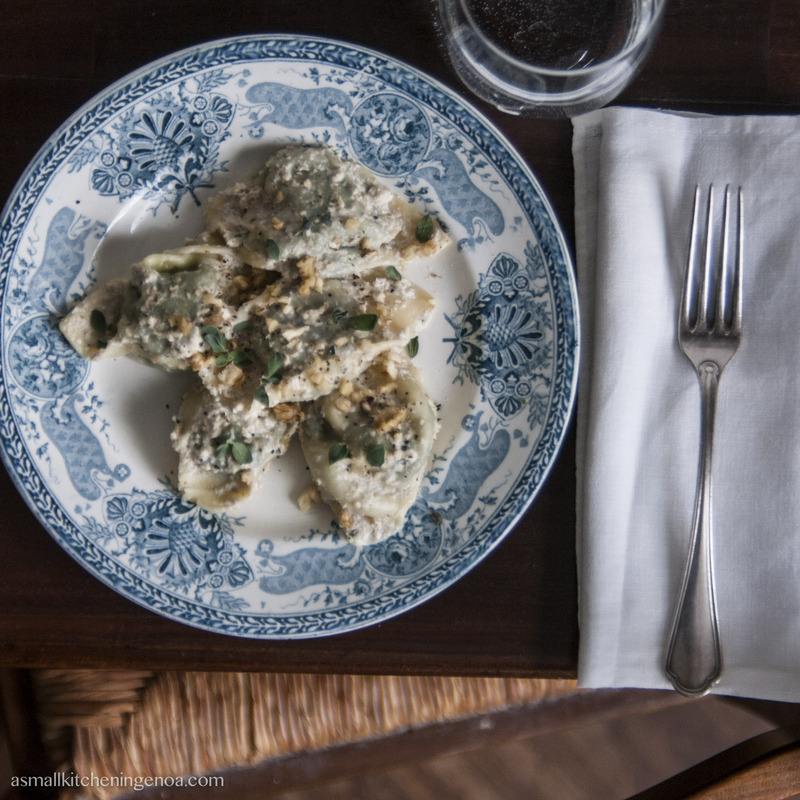 Put the greens in a big bowl, add the egg, the ricotta cheese, the parmesan cheese and the minced marjoram (I suggest to initially add half of it and then increase the dose to taste because marjoram has a very intense flavour) and add pinch of nutmeg. Stir carefully. Taste and add salt and pepper. 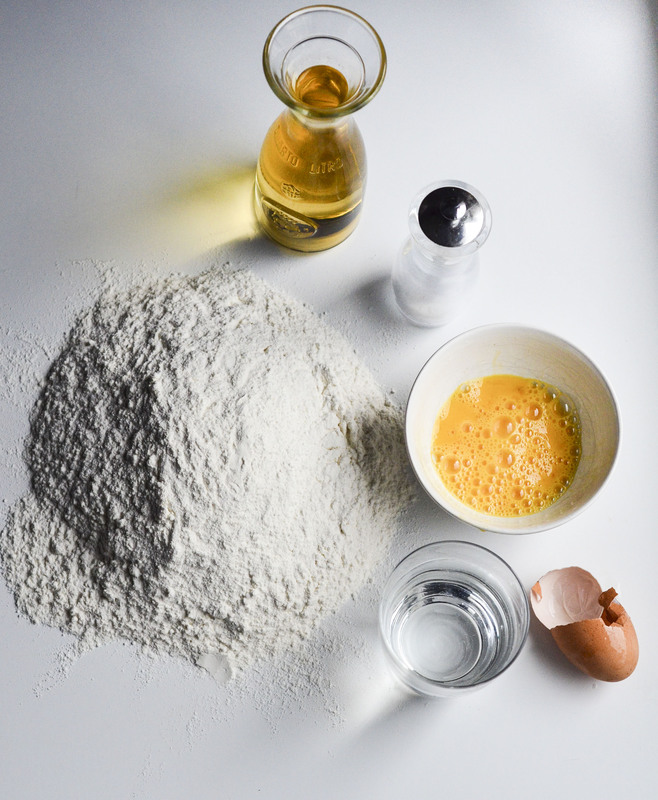 Divide the dough into four small balls. Take one at the time and leave the other under the humid cloth (if the dough dries it will become more difficult to roll and to bend). 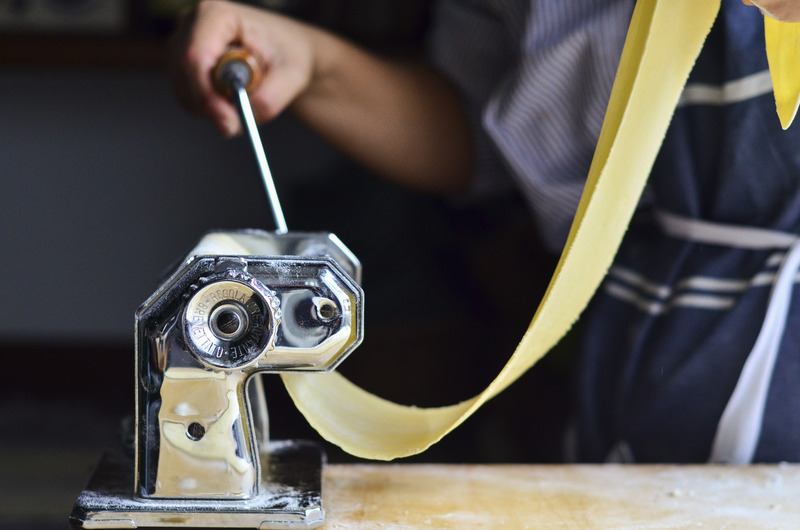 Roll the dough in a thin sheet with the help of a pasta machine (I have the old Imperia pasta machine of my granny) or with a rolling pin and cut it in small squares of 7-8 cm of side. Put in the centre of each square a spoon of filling. Wet the sides of the square with some water with the help of a brush and bend the dough along the diagonal obtaining a triangle. 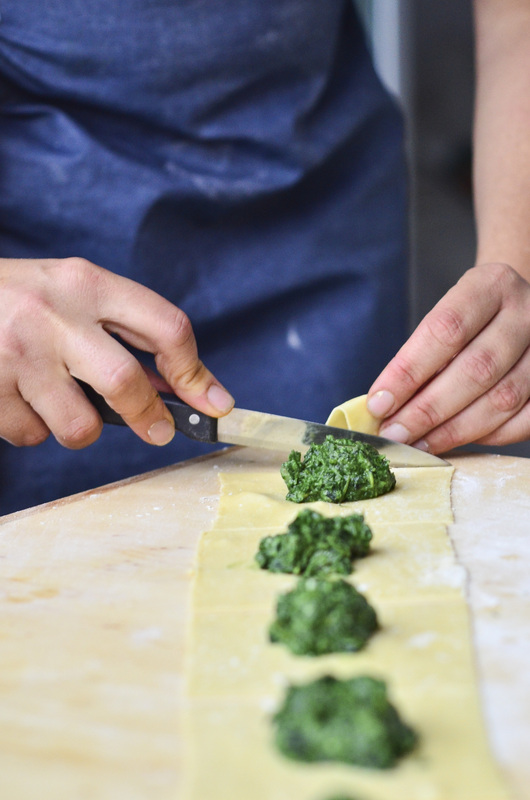 Press with the fingers along the borders in order to seal the filling inside the pasta. 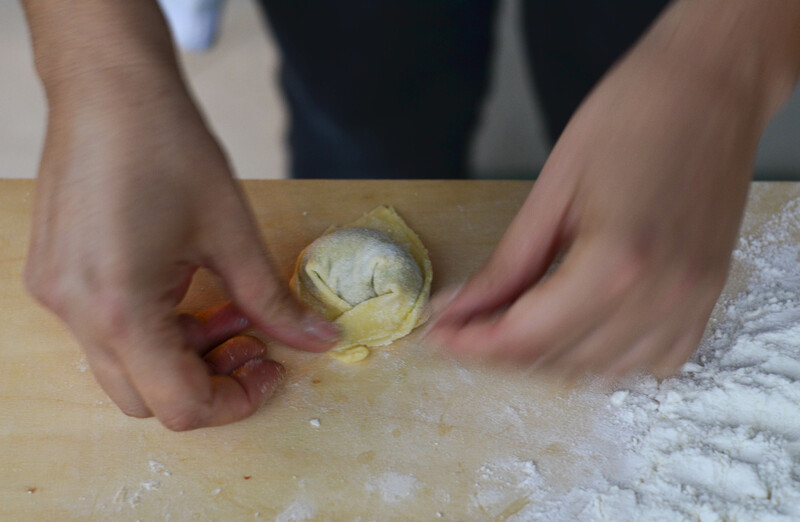 Try to eliminate the air inside the raviolo starting pressing from the centre to the sides. Join the edges of the triangle (those along the diagonal) and press with our fingers to seal them together. Your punchy pansoto is ready! 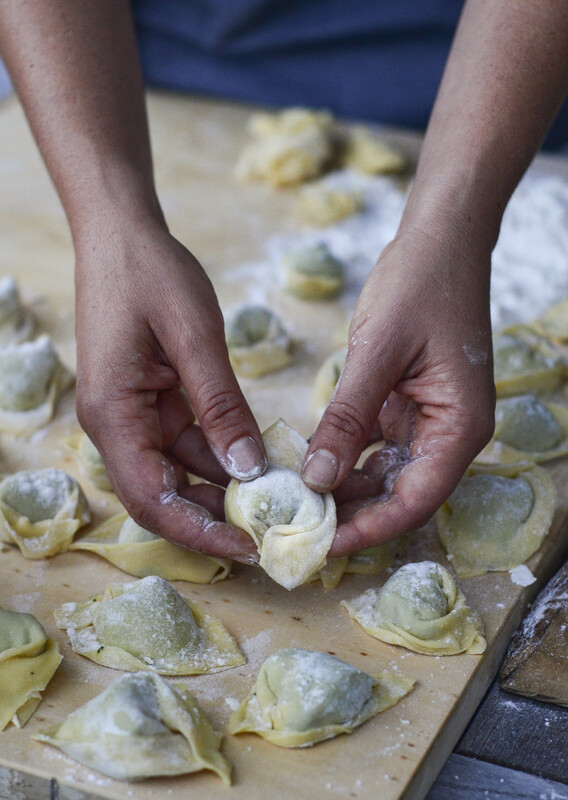 Lay each pansoto down on a surface dusted with flour and sprinkle with other flour. Boil pansoti in a big pan full of salty water for ab 8-10 minutes constantly giving a look at them! 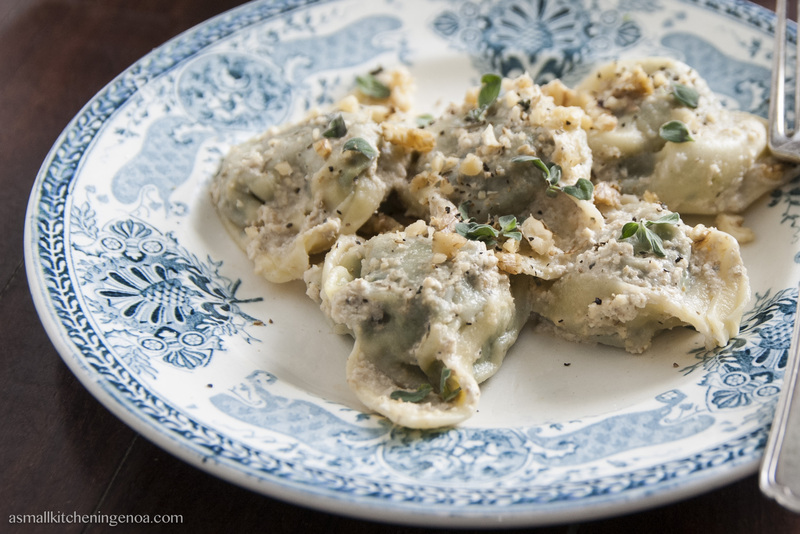 Homemade ravioli are always unpredictable, if they cook too much they will open in the pan. 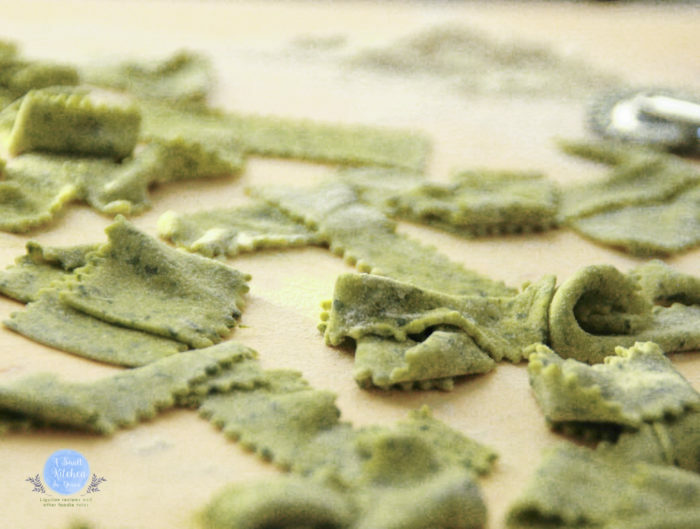 To be sure that they are ready taste a little angle of pasta on the sides. If it is cooked the pansoti are ready. 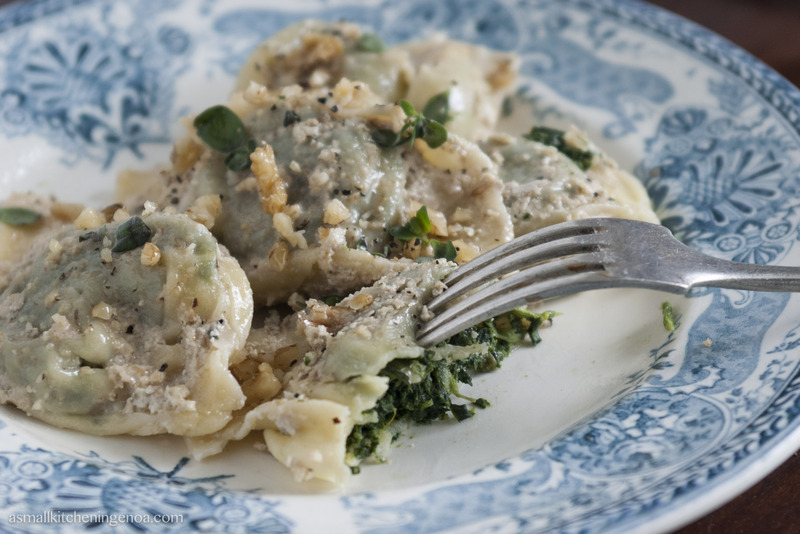 Season with walnut sauce or butter and parmesan cheese. If you don’t cook all the pansoti you have prepared (and you will prepare many) you can freeze them. Lay them down on a tray dusted with flour and put the tray in the freezer for 3-4 hours. When the pansoti become firm put them in a freezer plastic bag and you can keep them even for a couple of months. When you want to prepare them, you just have to put them freezed in the boiling water and let them cook 1-2 minutes more than suggested above. It took some time to make them but the pleasure will be long lasting! If you like this post and wish to help me growing please push the “share” button here below!